Just few days back my hubby came back home running from office with good news that at long last finally he had managed to get the full video of 'Bhuter Bhobishyot' online on You Tube. That night I finished cooking early and had dinner quick before time. Just when we sat to watch the movie in full enthusiasm, BANG, the movie is gone. Gone means it's removed, totally wiped out from You Tube video collection. Alas, with that went our only chance of watching the movie sitting here some thousands miles away from our country, down the drain. Aw man, I don't know when the movie will come printed in DVD and even it comes whether that will be available in US. For people not sharing my mother tongue, let me inform that 'Bhooter Bhobishyot' is a super hit Bengali movie. The rave reviews of the movie from those who have watched it has bred a desire in me to watch it too. Back to the recipe, 'Dim' in Bengali means Egg, 'Jhal' in Bengali means hot, 'Posto' means 'Poppy' and hence the name 'Dim Jhal Posto'. If you are contemplating to cook something different with eggs yet suitable to accompany rice or chapati, this is an ideal deal for you. 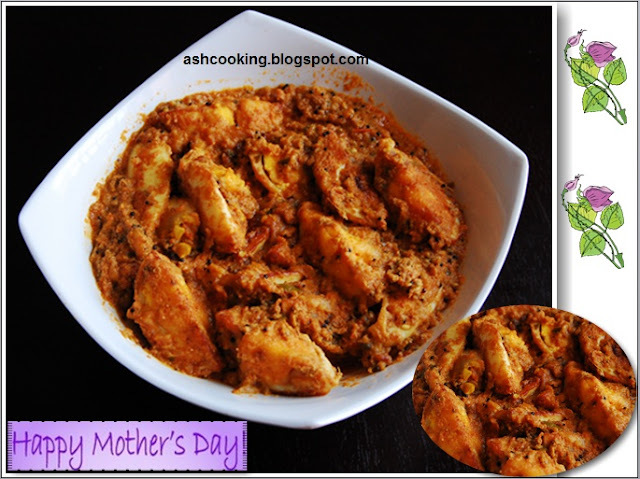 While cooking this egg curry today, I was missing my mother a lot. Hence I dedicate the recipe to my mother. 1) Mix in cornflour and all-purpose flour in a small bowl. Add water and stir it into a paste of thick consistency. 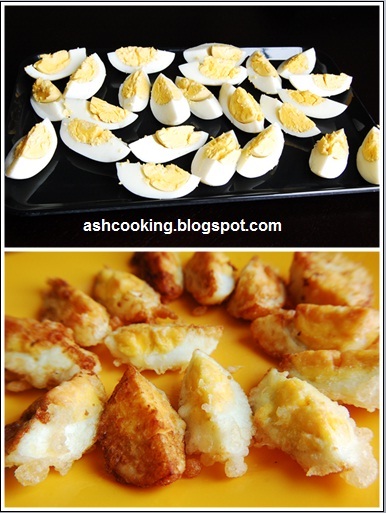 2) Dip the egg slices into the cornflour mixture and shallow fry in hot oil. Take them off the flame and set aside. 3) Now heat oil in a wok. When oil becomes piping hot, add the yellow mustard seeds and allow them to crackle. 4) Add tomato puree and green chilli paste. Sauté for 2 minutes. Add the ginger paste, dry red chilli powder, turmeric powder, cumin powder and coriander powder. Sauté. 6) Sprinkle salt and mix in. Slide in the fried eggs. Cook covered on medium heat for 1 more minute. 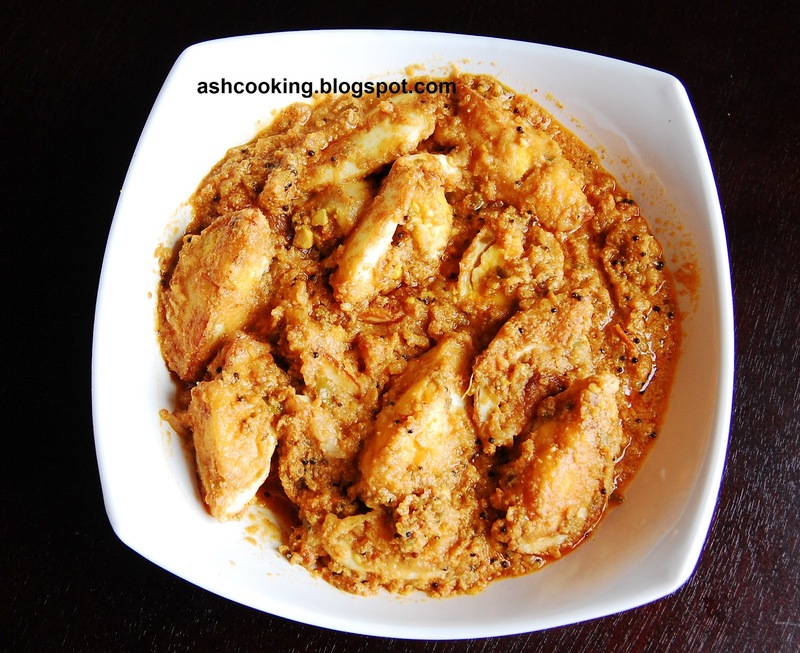 7) Serve hot with rice or chapati.